This article is adapted from a sermon, of the same title, I preached on 20 January 2019. The audio and video are here. What should a Christian think about abortion? There probably isn’t a more personal, more sensitive topic a pastor can discuss. I hope this article helps Christians think about this issue deeply and constructively, that it presents a winsome, persuasive case for unbelievers, and also showcases God’s grace, mercy and love – even in the face of a terrible sin like abortion. In this article, I’ll be talking about elective abortion. But, before we begin, it’s important for Christians to emphasize that God can forgive abortion. He can forgive anything, for anyone who comes to Him. Even though we’re each born as children of wrath, God is rich in mercy, grace, love and kindness (Eph 2:1-7). Why is human life sacred? Then God said, “Let us make man in our image, after our likeness. And let them have dominion over the fish of the sea and over the birds of the heavens and over the livestock and over all the earth and over every creeping thing that creeps on the earth.” So God created man in his own image, in the image of God he created him; male and female he created them (Gen 1:26-27). But, what does it actually mean to be “made in the image of God?” The Bible doesn’t explicitly say! We know it isn’t a physical resemblance; because God doesn’t have an innate, physical form – He’s a spirit (Jn 4:24; 2 Cor 3:17; 1 Tim 1:17; the shekinah glory cloud, etc.). So, even though Moses didn’t spell out exactly what this means; the Bible does hint at it over and over. From his fellow man I will require a reckoning for the life of man. “Whoever sheds the blood of man, by man shall his blood be shed, for God made man in his own image,” (Gen 9:56). When Adam had lived 130 years, he fathered a son in his own likeness, after his image, and named him Seth,” (Gen 5:3). And we all, with unveiled face, beholding the glory of the Lord, are being transformed into the same image from one degree of glory to another. For this comes from the Lord who is the Spirit (2 Cor 3:18). Christ isn’t the image of the Father in a physical sense; but He is the image in the sense of status and nature. This means that, the more Christlike a Christian becomes, the more he owns up and lives up to the image of the God in whose image He was made. One day, all Christians will perfectly reflect Christ and the ruined image will be fixed. This is why the Apostle Paul said that, as you put off the “old you” and replace it with the “new you,” you’re “being renewed in knowledge after the image of [your] creator,” (Col 3:10). “for those whom he foreknew he also predestined to be conformed to the image of his Son,” (Rom 8:29). “the first man was from the earth, a man of dust; the second man is from heaven. As was the man of dust, so also are those who are of the dust, and as is the man of heaven, so also are those who are of heaven. Just as we have borne the image of the man of dust, we shall also bear the image of the man of heaven (1 Cor 15:47-49). We, alone among all of God’s creatures, have the self-determination, intelligence, self-awareness, introspection consciousness, willpower, and emotions to actually know God, respond to Him, love Him, love one another, and do all the amazing things God has created us to do. Christ is the model for the perfect human, because He (1) has perfect fellowship with the Father, (2) has perfect obedience to His will, and (3) has perfect love for others. This is why the Apostle Paul says Christians are renewed in Christ’s image bit by bit, little by little – the more you reflect Christ, the more you live up to the image of God you were created in. What does it matter? What does it have to do with abortion? 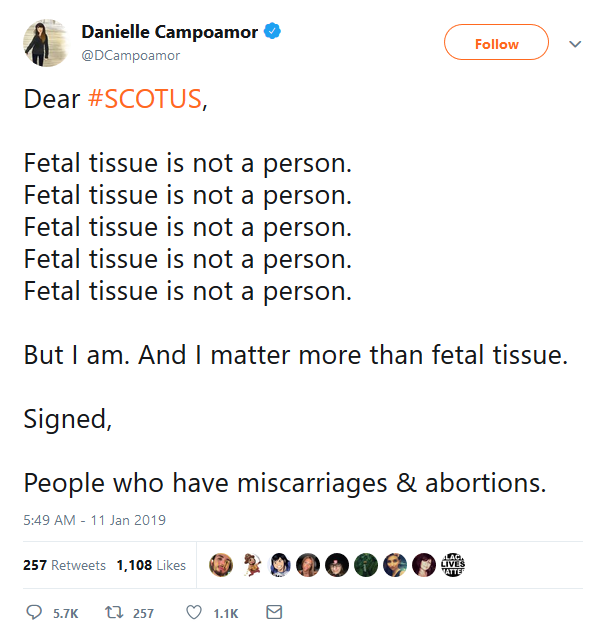 It matters because babies are made in God’s image, too. Babies were made to reflect God’s glory, to have a chance to live their own lives, have their own children, and to (hopefully) honor the Lord by their lives; to see their own grandchildren do the same. Human life is sacred because it comes from God, who made it sacred for a reason – that’s why God told Moses it was a capital offense to take someone’s life; “Whoever sheds the blood of man, by man shall his blood be shed, for God made man in his own image,” (Gen 9:6). What is the essence of the other position, the other side, the pro-abortion side? How do they define “personhood” and assign it value? as having intrinsic worth and dignity in God’s eyes. It’s a structural thing, hardwired into the very makeup of our creation; it’s a status thing! It gives intrinsic status, worth, and dignity to people because of what they are and who they are! It has no logical stopping point; do small children and the elderly even count, for example? On what basis, given the argument? This article will continue in the next installment. 1 I am heavily indebted to Millard Erickson, Christian Theology, 2nd ed. (Grand Rapids: Baker, 1998), 517-536. He has the best discussion on this issue. 2 For this discussion, I’m heavily indebted to John S. Feinberg, Ethics for a Brave New World, 2nd ed. (Wheaton: Crossway, 2010), 63-109. 3 “The initial point is that neither sperm nor egg alone is a human being. If sperm doesn’t fertilize an egg, both will die. No one would think an entity has died, mourn, hold a funeral or do anything else appropriate at the loss of some being like a human baby, or even the loss of a dog or cat. On the other hand, once sperm penetrates an egg and fertilizes it, a new organism exists that begins to develop into the baby that will eventually be born, grow to old age, and die. There is continuity between the initial one-celled organism formed at conception/fertilization, the one-celled embryo, the multi-celled embryo, the fetus, the newborn infant, the adolescent, and the adult who one day will die,” (Feinberg, Ethics, 89-90). 4 Of course, Christians are open to the charge of circular reasoning, here. Are Christians saying, “the Bible says human life is sacred, therefore human life is sacred, because the Bible says it’s sacred?” If that’s all one says, then it is circular and shallow. However, everyone begins from a certain presuppositional standpoint. The key is to weigh which presupposition actually has grounding and credibility. Which worldview best fits the evidence? For a brief discussion on the charge of circular arguments, see John Frame, Apologetics to the Glory of God (Phillipsburg: P&R, 1994), 9-14. There is definitely a profoundly different view of what makes a someone a living person, with all the rights a person is entitled to. It's hard to see how a society not rooted in a Judeo-Christian worldview can get there, but there are actually multiple ways. The truth about this is sturdy, and though deniers may dominate for a period, it's increasingly hard for them to do that at the "hearts and minds" level -- even with the confused philosophical context. So for now, they do it through politics and intimidation.